This book addresses the continued lack of the diversity in veterinary medicine, the least inclusive of all medical professions. Effective navigation of the complexity of diversity and inclusion in veterinary medicine requires clear enumeration, recognition, and understanding of key issues, challenges, and opportunities. In a nation with rapidly changing demographics, public needs and expectations of the veterinary profession will continue to evolve. A more diverse scientific workforce is required to feed the veterinary profession, not just for the purposed of equity, but as necessity for its sustainability and relevance. The book lays out the history of diversity in the veterinary profession, in the context of historical changes and actions within US society. An overview of selected strategies from dental, pharmacy, and (human) medical schools is then offered. The impact of social constructs on career interest development is explored using the examples of race, gender, sexual orientation, and gender identity. Practical strategies for attracting preschool through undergraduate students to careers in the veterinary profession are presented, as well as metrics and tools to assess the impact of diversity and inclusiveness strategies. A systems approach to diversity and inclusiveness in the veterinary profession is called for in a manner that frames barriers as opportunities for improvement and progress. There is much that needs to happen to achieve professional inclusiveness and cultural competency, but the path to achieving this is clear. System-wide commitment, planning, execution, and continuous assessment will position the profession to better suit the population of the nation and the world that will be served. This book is a call to action for consistent championship and cohesive approaches, and it provides a road map to building a sustainably inclusive future. ". . . a jewel of a book that will serve as a valuable, well-referenced resource for anyone with an interest in understanding the subject of diversity and its impact on veterinary medicine. 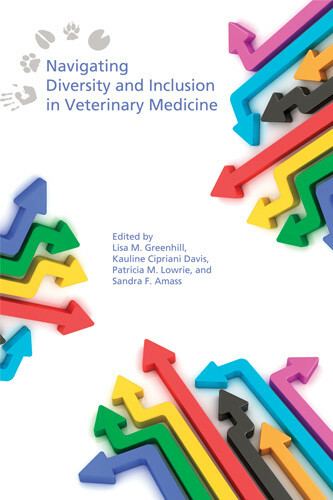 The contributing authors have navigated diversity and inclusion in veterinary medicine from the perspective of the profession’s history and many stakeholders, including academics, the corporate world, government, students, and society as a whole." Lisa M. Greenhill is the Associate Executive Director for Institutional Research and Diversity for the Association of American Veterinary Medical Colleges. Her work primarily focuses on the ongoing development and implementation of the DVM: DiVersity Matters initiative at the national and local levels as well as promoting the veterinary medical profession within communities of color. Her work includes: developing population‐specific outreach, recruiting, and retention activities for K‐16 students; developing retention and other programs for URMs enrolled in veterinary medical colleges; developing programs and services for faculty, staff, and administrators of veterinary medical schools and medical school graduates; developing and maintaining collaborative relationships and knowledge of diversity initiatives of other health professions; monitoring legislation that affects admissions efforts that promote diversity; and directing the Association's national research agenda. Lisa is the recipient of the Emerging Leader Award from the National Association of Minority Medical Educators, Inc.
Kauline Cipriani Davis is the Director of Diversity Initiatives at the Purdue College of Veterinary Medicine. She is responsible for developing, implementing and coordinating initiatives to enhance diversity and inclusiveness. Dr. Davis has served as Assistant to the Provost, with responsibilities in academic affairs and diversity, and as Assistant Director of the Women in Science Programs. She has been a co‐mentor for the Summer Research Opportunities Program, an advisor for the Black Graduate Association, and has worked closely with the NIH Summer Research Institute for Diversity in Biomedical Sciences, the LSAMP/AGEP Program Offices and the Purdue Chapter of Minorities in Agriculture, Natural Resources and Related Sciences. Dr. Davis currently advises the PVM chapter of Veterinary Students One in Culture and Ethnicity, a national student organization that provides leadership in the exploration of issues of diversity and inclusion. She is the recipient of the Engagement Award from Purdue’s Black Graduate Association. Patricia M. Lowrie serves as the Assistant to the Dean in the College of Veterinary Medicine and is also the director of the Women’s Resource Center at Michigan State University. In veterinary medicine, her role is to enhance educational and professional opportunities for underrepresented groups in the health professions. In both roles she develops and implements strategies that facilitate organizational inclusiveness. As part of a collaborative broad‐based university team, she also advises the university leadership on effective methods to engage various constituent groups in synergistic activity that move beyond anti‐discrimination teachings and begins to infuse social justice education more comprehensively into the institution. She is the recipient of the MSU University Diversity Award was recently recognized by the Association of American Veterinary Colleges for her contributions to veterinary medical education. Pat currently is a Senior Fellow at AAC&U and serves as chairperson of the advisory board for Campus Women Lead. Sandra F. Amass is the associate dean for engagement and a professor of veterinary clinical sciences at the Purdue College of Veterinary Medicine. Her responsibilities include the coordination of P‐12 outreach programs for the veterinary school. Dr. Amass is researching methods to diversify the veterinary profession by exciting students who are underrepresented in veterinary medicine about careers in veterinary medicine. She has formed research teams to study the perceptions that children and the public have about the profession and the impact of P‐12 publications, role models, and educational programs on these perceptions. She is a co‐PI on the Fat Dogs and Coughing Horses Program, a cooperative effort funded by NIH/NCRR/SEPA to develop educational programs for P‐12 students and the public about the science involved in keeping people healthy. Dr. Amass has previous experience as an editor of two Purdue University Press books.